School bullying is THE hot button topic and buzzword nowadays. As a teacher during my day job, it's a topic that frequents the halls of my school. There's a fine line between bullying and kids being mean. That's not a statement meant to ruffle feathers because once the mean-ness escalates into an unevenness of power, that's when it crosses the line. 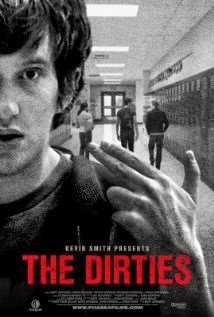 THE DIRTIES is a film shot like a documentary but depicts the fictionalized account of two high school boys, Matt and Owen, who are bullied on a daily basis. Matt and Owen are aspiring filmmakers. Matt constantly name drops scenes and actors to get Owen to understand his visions. They're taking a high school film class which seems more like the class slackers take for their arts credit to graduate, than for the actual study of film. There's an omniscient third friend who follows them around constantly taping them for their film project, but ends up capturing the day-to-day torment these two receive at the hand of the dirties, or their bullies. Matt's film for class hits close to his personal life. He creates a detective "thriller" about killing the Dirties, the local gang. But as his high school life starts to wear him down, he comes up with the "brilliant" idea to actually kill the real life Dirties and tape it. As the evolution of Matt and his scheme occurs, Owen begins to face a real conflict. First, he wants to stand by his friend because he too is the subject to daily abuse. But, at what point is retaliation too much? Sure, we all have dreams of fighting back and getting revenge on anyone who makes our life a living hell, but most of us never act out and certainly never contemplate killing. The script allows for us to take that journey of choice with them. The tension with each conversation the two boys have when the subject is brought up resonates with the audience. Then an interesting shift happens. Matt assumes Owen will automatically go along with his plan because they are best friends and best friends support each other. Unintentionally, Matt has moments where he actually bullies Owen a bit because Owen won't follow along. It's a very subtle shift in character, but it shows how easily an idea can engulf a person. As an actor, Johnson completely nails the struggle and angst of his character. Director, editor, writer, and actor Matthew Johnson has created one of the most significant bullying movies in recent memory. With his character, we sympathize with his struggles and root for a better life for him. In this particular school, being a movie nerd makes you an outcast. Of course, loving film myself, maybe he pulls at my heartstrings a little more than normal. But as the film went on and Matt kept harping on his plan, the tension building around his ultimate decision makes the film reach almost thriller lever. The aspect which was most enjoyable is THE DIRTIES doesn't look to glorify the bullying victim. Matthew Johnson has created a very important film. It's a very realistic depiction of the mental toll being bullied takes on an individual and the choices teenagers should never have to make.